What we knew about marketing could fit in a shot glass, but man, the new trailer for "The Social Network" is even more grating than the teaser that came out a couple of weeks ago. The movie stars Jesse Eisenberg as Mark Zuckerberg, the 25-year-old billionaire behind Facebook, telling the story of the controversy surrounding how he built his empire. The film co-stars Andrew Garfield (your new Spider-Man), Justin Timberlake and Rashida Jones. 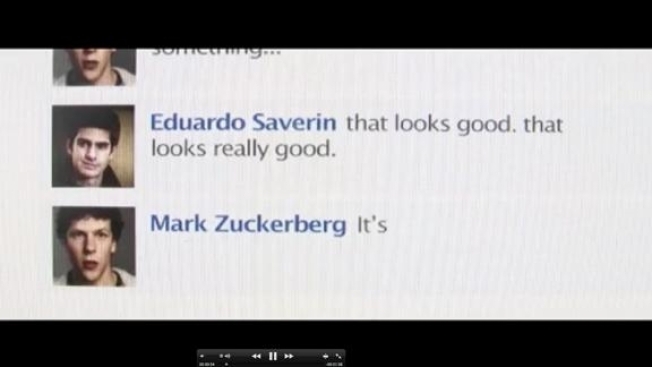 "The Social Network" was written by Aaron Sorkin and directed by David Fincher, one of America's greatest living directors -- so why on Earth is the new trailer nothing more than a instant messaging free-for-fall with narration, much of it from the original "clip"? Do they want people not to see the movie? We had this ready to post when the trailer first appeared online yesterday afternoon, then we heard that Sony was asking people to pull it down, so we decided to hold off until they released the "official" version, which is virtually identical. The movie comes out Oct. 1, and we're gonna see it in spite of the trailer.